Pulled up on the Broad St bridge with another 6″ meatball sub, but today in tie and nice clothes. I need to eat something that is less messy. Anyway, Beauty was at the box with Archer nowhere to be seen. Eventually Beauty flew low over Exchange towards the Wilder Bldg. I lost sight of her, and did not see her reappear. However Archer (several minutes) later came out from that direction and went to OCSR. It was after that when Beauty soared high overhead, slowly drifting and meandering off to the northwest. Watching her, I did not see Archer take off. Jim P showed up and we chatted for awhile on a very nice day, standing over the turbulent spring waters of the Genesee River. Soon enough it was time to return to work. Stopped by the Broad St bridge with a Subway’s meatball sandwich and caught sight of Dan S, sitting in a chair on the bridge, and apparently not up to a whole lot. He directed me to a parking spot (charging $5.00 in the process) and briefed me on the location of falcons. One on Ocsr and the other unlocated, whereupon I spied it on Mercury. Dan S cursed and grumbled about how sneaky peregrines are and we settled into a very, bery blustery watch. There was lots of flying and courtship activity this weekend. Saturday was nice and sunny, but Sunday afternoon became windy, cloudy and rainy. Despite the change in weather, my watch was rewarding. Here are some pictures from Saturday and Sunday’s afternoon watches. Around 1:00 PM yesterday, a Red tail hawk was spotted flying over the river near the Broad Street bridge. One of the Falcons (we think Archer) reacted to this territory-intruder and swiftly went after it, pushing it out of the area, south, into the Corn Hill district. Watching through our binoculars, we saw the falcon repeatedly dive bomb the Red tail. At one point, the poor hawk landed on a roof and seemingly didn’t know what else to do except just sit there and take a beating from the falcon who just kept swooping down on it. Eventually though, the falcon came back and took up a guard position on the Mercury statue. But wouldn’t you know, about 10 minutes later, the hard-head came back again. But this time, he came back with a second red tail - it was kind of like he was bringing his big brother to settle the score. However, the hawks must have been surprised when both falcons took to the air. And it seemed that big brother disappeared quickly, leaving the same poor red tail again in the same predicament. Sure enough, the falcons again started going after him. The hawk landed in the safe haven of a tree next to the library, Beauty went back to the nest box, and Archer again took up position on Mercury. I managed to get a few shots of the hawk while it was in the tree- it had such a sweet face and it looked like he was just plain tired from getting beat up. Eventually, the hawk flew under the bridge below us. We didn’t see him come out on the other side so Dana and Carol took a walk to a driveway near the Convention Center to take a look under the bridge. They couldn’t see anything. The hawk appeared again later, flying over the river where it flew up under a structure that’s on the east bank of the river, next to the convention center. After a short while, he came back out again and Archer immediately went after it, swooping on the hawk as it flew across the river and back, where it landed in another tree. We couldn’t help but feel sorry for the hawk – he just didn’t have any place to go and Archer was on him as soon as he took flight. While the hawk was sitting there in the tree with Archer peering down on him from Mercury’s heel just waiting to attack it again, we noticed a group of pigeons perched on the wall looking into the river, seemingly watching the interaction like spectators at a Ultimate Fighter’s Championship event. We had to laugh. But we really hoped that the hard-headed hawk would just leave the area and live to see another day. Our prayers were answered when he eventually took off and flew south, hugging the wall by the library and escaping under the Court Street bridge. We wondered what would drive such behavior. Perhaps there is a food source, such as vermin in the subway area, that the hawk is familiar with and was determined to go after, but now, with Archer’s return, that area is within nest box territory and is now off-limits. Whatever it was, I think the Broad Street bridge might be prime viewing territory for us watchers and I think yesterday provided a glimpse of how things might be with the new pair and the new nesting location. Hard-heads beware! Headed downtown with Cleo, the Catahoula Leopard dog for watching before the weather turns rainy and freezing. Beauty was at the scrape and Archer nowhere to be found. After a couple of minutes, Carol P pulled up and we began to chat. She noticed Archer had arrived and landed on Mercury’s base. Suddenly Archer ripped across Broad St, over our heads and stooped on an intruding redtail. I thought Archer was going to fly into the bridge; he came so close to the railing in order to get to the redtail. There was a man walking down the bridge and Archer went right past him. I don’t know if the man was aware of what had just happened. 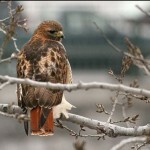 Archer stooped and stooped on the red tail who landed in a tree near the bridge and library. In between stoops Archer kited on the winds over the Broad St bridge, presenting a spectacular view of his flying abilities. Eventually Archer returned to Mercury but kept a sharp-eyed lookout on the hawk. Carol and I headed to the east end where we were about 30 ft from the hawk. The view of the bird was magnificent. We stayed there about 15 minutes when the red tail took off to the south. Archer immediately came off Mercury but with the red tail heading away, Archer kited briefly and returned to Mercury where he spent the rest of the watch hunting. Taking advantage of the sunny skies, I stopped downtown for an hour to check on Beauty and Archer. As many of you saw on the webcam, Beauty was perched at the nestbox platform. Archer was on Old Changing Scenes. Here are some shots taken on Wednesday morning from ground level. I spent some time downtown on Wednesday afternoon learning how to navigate the much different environment than I’ve been used to in my ten years of watching the Rochester falcons. As a bonus I got to see a nice intruder chase, and take some pretty shots of Archer and Beauty to boot. Read all about it in my latest Peregrinations post. Most of you have probably seen the wonderful news that Archer returned to Rochester this morning. Many of the Watchers gathered to see Archer and Beauty renew their bonds with each other at the Times Square nest box. It was a wonderful day. Below is a link to some pictures I took during my Watch. Enjoy! 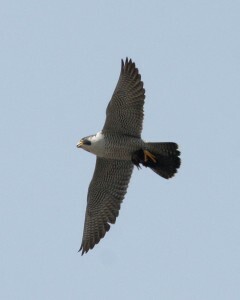 This is not about the Peregrines of Rochester, but it is about their smaller cousins. At about 4:00 pm, I was on my way home after checking out the downtown area (no luck finding Beauty) and I decided to drive by the Kodak Tower after reading Joyce’s tweet that a Peregrine had been seen flying around it earlier. Well, I think I know why Beauty is heading in that direction. I met Dana near the old visitor’s parking lot and we got to talking. Something caught my eye, a bird flying off of the lily’s at the top of the tower! It flew over us heading towards the river gorge, crying it’s distinctive call. It was a Kestrel and a very noisy one. Then a 2nd Kestrel flew from the tower. This one landed on top of the High Falls Stack. The 1st came back towards us, heading towards the High Falls Stack and his mate. They copulated and then stood next to each other at the stop of the stack. That’s when yet another Kestrel flew in from the NW. This one flew back and forth over the first two and then landed on top of the stack on the north side. Dana and I walked over to that side. We thought we might have seen a 4th Kestrel fly off of the Catwalk, but we can’t be sure. For those of you that have followed Mariah & Kaver and read the reports from the earlier years, you might remember that there were Kestrels nesting somewhere in the BeeBee Plant. There were constant battles between the Peregrines at the top of the Kodak Tower and the feisty Kestrels at the BeeBee Plant. Mariah would stoop off of the tower and chase the Kestrels around the lower buildings. The Kestrels would follow Mariah back to the top of the tower and harrass her, until they were again chased off. It’s what we watchers called Kestrel Runs. There have been no Kestrels nesting near the tower for a couple years that we know of. 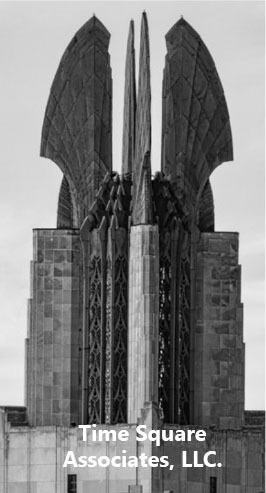 Now that there are no Peregrines nesting on the Kodak Tower will the Kestrels return? Should be interesting. So, is Beauty flying out to the Kodak Tower because she’s been seeing the Kestrels flying near it? We know that she had been seen chasing a Kestrel around Midtown Plaza earlier. So it could be the reason I’ve been seeing her head in that direction the past few days. Also, this morning Beauty was seen on camera at the Times Square Nest Box three times. Some of you may have seen her.